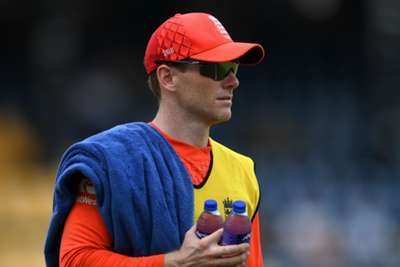 England must address the "very poor" attitude they displayed in a record-breaking defeat to Sri Lanka in Colombo on Tuesday, says Eoin Morgan. Sri Lanka inflicted England's heaviest ODI loss with a 219-run triumph on the Duckworth-Lewis-Stern method after posting a monstrous 366-6 in the final match of the series. Niroshan Dickwella was the top performer with 95 off 97 balls, while captain Dinesh Chandimal made 80 despite being put down twice early in his innings. Morgan, who dropped himself and rested Chris Woakes and Olly Stone, felt being posed such a daunting challenge was useful for England, albeit their response - they slipped to 132-9 by the time rain arrived to end play early - disappointed him. "For 50 overs we were under serious pressure and we didn't have a lot of answers. That gives us a good opportunity to go back and look at everything from preparation right down to the end result. That's always better when you've been put under a lot of pressure," said Morgan. "We didn't take our game forward today. There were areas it went backwards. Our fielding was extremely poor, our attitude was very poor and that has to be addressed. "We will break it down and find an answer because otherwise we're just papering over the cracks which is not what we want to do." Morgan backed his decision to include Sam Curran, Liam Plunkett and Mark Wood with England having already wrapped up a series victory and next year's Cricket World Cup on the horizon. "Sam has only played his second ODI today," Morgan said. "If we're going to be serious about considering him as a potential replacement if David Willey is injured for the World Cup squad, we need to know more about him. "Today we learned more about him. If Sam Curran's name goes down on that paper we know what his strengths and weaknesses are now, and we try to improve them as we go along. "When you leave yourself out the one thing you don't want to compromise is winning the game - that's the best environment to learn from. But on the other hand, you want to see the players who come in be challenged and put under pressure. That's one thing we definitely saw today. "People will say you don't want to see your bowlers hit all over the place, hit back over their head, but I think it's necessary to learn. When we go into the World Cup and play against the better teams they perform like that on a regular basis. "It's not that you want to get used to it, but you want them to get used to the situation, and experience refocusing for the next delivery."